"Putting A Face on Radical Environmentalism"
"Humans have the innate propensity to take a moment in time and attempt to preserve that moment as a sacred moment for all time and do so using propaganda, myths, distortions and lies, or by forcing public policy and lobbying for new laws. Such is the state of environmentalists and environmentalism today. They think in terms of short spans of time, as in a generation, or a century. They fail to realize that time is dynamic, ever-changing and ever-evolving over tens of thousands and millions of years. In the process, certain species survive by adapting and new species erupt to fill the changing environment, including humans. Every day species go extinct as eco-systems change in response to natural forces ..... or human forces. That is the story of non-linear dynamic systems on planet Earth. Neither the Earth nor time, stand still. Man can't freeze time. Man can only temporarily alter it for short periods. What environmentalists also fail to realize is the disastrous affects their policies and laws have on real Americans who must suffer the consequences of environmentalists and government trying to "freeze" time with draconian, unconstitutional environmental laws." Life on Earth offers many, what are called non-linear dynamic systems. Eco-systems, oceans, the weather, the stock market, commerce and trade, currency exchange, welfare and the poor and the behavior of people, are just a few examples. They are characterized by having many different variables that determine their instantaneous conditions. Each can be altered dramatically with small changes in one or more variables. Government, by far, is the worst perpetrator of messing with non-linear dynamic systems that end up having disastrous unintended consequences. These unintended consequences are abundantly apparent by observing the Obama Care disaster and the irreversible damage it is doing to the American health care system. Radical environmental law is doing the same thing to constitutional safeguards on property rights. Every week we get calls or e-mails from landowners from all over America who have come up against the consequences of environmental law, passed by governments who are lobbied by radical environmentalists. The foundation of most environmental laws come from the United Nations radical Agenda 21 accord adopted by over 170 nations, including the United States, at the Earth Summit in Rio de Janeiro in 1992. The flawed premise of Agenda 21 is that man is a virus that must be rigorously controlled in all forms of behavior, in order to save the planet. That control, defined by Agenda 21, takes no account of American constitutional property rights. In fact, it tramples all over those rights. Here is a response from one of those "faces" of radical environmentalism, a family that was destroyed by the Army Corps of Engineers, who charged the family with filling in a wetland, a federal offense, but the family wasn't filling in a wetland. The family had all the permits to do what they were doing but the Army Corps ran rough shod over them in court and their permits were ruled inadmissible. The family lost a going business, their entire savings and their farm to the fight with the Army Corps of Engineers. They were literally left on the street with nothing but the clothes on their backs. The following words from the surviving spouse of this family are heart wrenching. "Until America becomes aware and fights justice for just "one individual family" being destroyed, how we were and others, it's evident "the takings" will continue one by one until all is gone and the American dream left desolate and completely lost. After all, it wasn't their fight ..... it wasn't their property taken ..... it wasn't their family destroyed to death!" "It was corruption at the highest. We fought with truth long and hard. Courts did not want to hear the truth, only the lies that drove their agenda. That's how the system works. It is entwined with a political agenda wrapped up in lies signed by high-powered attorneys and politicians. Yes, all in the name of fighting against "Private Property Rights". A twisted unbelievable story but the facts are clear! It's like how Benghazi is being handled now!" "You are right on when you say that most people do not realize how big this issue is, with Americans being taken down one by one. Those that believe that way have not lost like we have. It was 3 years on Feb 9th that my husband passed instantly from so much stress. His hard work and fight all those years in what he believed in, finally overcame him when he had to face his children and what they lost too from the loss of our farm and business. It was too much for him. The stress just sort of ate away at him. He passed in an instant and I know God took him as easy as he could because he worked so hard his whole life for the love of his family and then lost it all. Our sons lost all and he could hardly face it. His faith in God was much but his heart was broken. We tried to start over so we could financially take care of our selves and we couldn't even finish that when he went to rest. I am still trying to do little by little for myself, still hoping I can find a way to proceed, or get something together for some income." Ladies and gentlemen, we can assure you that this is not an isolated story. Here is another. "In the middle of the night Raven heard clanging and banging near her hayfield, down by the tide gates that kept the Grays River from flooding her property at high tide. The tide gates were installed many decades ago near the mouth of the Columbia River, where it empties into the Pacific Ocean. These tide gates were essential in protecting prime agricultural property from tide and river flooding in the Grays River valley and other valleys feeding the Columbia River." "Raven bought her land in 1999, not knowing the horror she would endure at the hands of the U. S. Fish and Wildlife Service (USFW) and two non-governmental organizations (NGO’s) known as the Columbia Land Trust (CLT) and another NGO, Ducks Unlimited (DU). Armed with millions of dollars of federal grant money, USFW and the two NGO’s set about to restore the Grays River to its pre-human days, in the pursuit of salmon habitat recovery." Raven eventually gave up, abandoned her land and moved to Idaho to live with relatives. This is just one more story out of the thousands of stories just like it, as these kinds of government/private partnerships are terrorizing rural landowners for the sake of fish, wildlife habitat restoration, endangered species and other environmental projects, driven by the United Nations Agenda 21 accord. Each one of these two stories is true because we have personally talked with both of them. Multiply these two stories by tens of thousands and you just might get the size and scope of the injustice being inflicted on rural landowners in the name of radical environmentalism. We could tell you many more such stories. 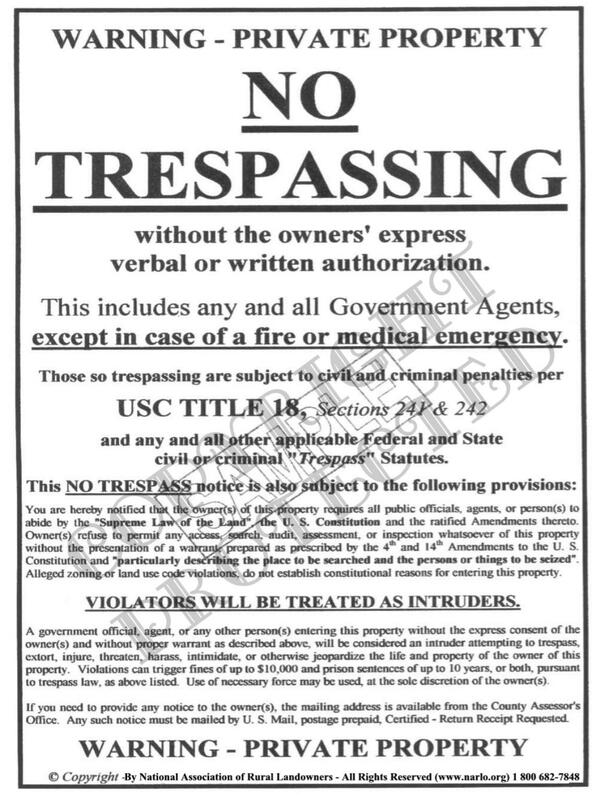 The fact is, constitutional protected property rights under Agenda 21 have become meaningless, as the onslaught of environmental carnage through law and bureaucratic rule making continue unabated and the hapless American rural landowner, acting alone, is powerless to stop it. As a tribute to these forgotten faces of radical environmentalism, we have prepared a 12-minute video based on one of our last year's article with the same name. It is a must viewing for any urban or rural landowner. "Rural America In The Cross Hairs"
These same types of individual injustices being inflicted on rural landowners are also being inflicted on tens of thousands of American taxpayers who find themselves in the jaws of the IRS. In the hopes we can provide some clarity to the IRS dilemma, be sure to visit our IRS information website HERE. It seems almost impossible to bring all of this plight into the media but maybe just maybe if a "group of strong legal attorneys" that have this plight in their "fight" could somehow introduce this horror to possibly someone like O'Riley or Glenn Beck or one of Fox's news "stars". This special group would take on an individual circumstance as a whole like what you are doing. I suspect though maybe this has already been tried and they weaken at the knees also. I still live with all the tangled happenings in sequence in very vivid picture and have every document like a diary. I will keep always just in case one case will come to the public view just how corrupted they work it all. I can provide stories and proof and the individuals that lied and cause for their political gain, that is very hard to believe and where these renowned world famous Jones Pogue and Day attorneys lied and put their very credentials signed to lies they created themselves without blinking and eye that they feared no judges because they were installed to office by political organization that hired them and only saw and heard and believed their cronies. It's a nightmare that stays with you in sequence always. I have saved all letters and documents in sequence for the purpose to prove the extent of entwined corruption they will do for proof, just in case anyone does want to get public involved by media and maybe - some day some brave group may want to take on to courts individual cases brought to view to the public in continuous episodes of nightly TV of family one by one brought to high courts I believe would be the only way other then what you are doing. You have many cases documented. It has to become massive knowledge to the people as it seems majority of people that live "city life" do not know yet that their existence they so freely live and eat comes from that part of working backbone of America which is so necessary so they can have their city high technical paid seated jobs that pay them even more money then the ones that provide their existence. The original plan of Gods creation for man and the future plan on a new heaven and new earth, is that "one man will not work and the other eat". but fallen to sin "the poor will be with us always so therefore we provide. Agriculture and all things were created for man and his existence and not "man created for "all things" and their existence! Very common sense Gods plan "was" but of this human existence and change of plans evidently comes from ruthless greed and destruction from an adversary clothed in many forms of agencies to destroy One nation under God and it's existence of freedom as intended . What part of man does this change of God's given rights? What man places himself in this circle for his own gain or worse yet be like a puppet for the man that has this agenda? and what part of man will stand up for those rights now that he has taken all for granted. Our forefathers did this for us signed with blood and now will we stand again? Most are sleeping unarmed and without the knowledge that their American dream from the Agricultural way of life that gives to all for human existence as it was meant to do can be consumed from them as the silent reaper slowly confiscates their hard work of a lifetime their land their home and they waken from the American dream to see they have been targeted for their hard work of assets that they have shared already by supporting their selves and others then left desolate with no armor of a government to protect their people but designed agencies to devour their share of assets so rightly earned. It's about 2:30 am and decided to write my thoughts as I read your site again. I saw the grief of a farm lost and auctioned off and it cutting my own heart again for them and maybe a suggestion that already has been tried but to no avail. I am a little older now but still open to anyone that I can answer any questions that happened that they wonder about in case they read my web site. Maybe you won't get even this but It's just thoughts when you can't sleep but try to console myself that God will give us back what we earned in the new heaven and new earth. Judgement will come to those who so cunningly gained another man's lifetime of work and yet hope another family does not suffer this. Just want to thank you again for doing your part in making all you can be known.